The most visible new feature premiering on Quantum of the Seas will be the North Star - - a large crane-like arm located on the top deck that will lift a windowed capsule 300 feet above the ship and out over the sides of the ship. Up to 13 guests at a time will be able to take 15-minute “flights” in the North Star. These rides will be complimentary although Royal Caribbean also envisions premium offerings such as private flights and flights at sunrise and sunset. “It is an opportunity to get the big view - - the big view of the ship looking down or the big view of the ocean all around or in the ports of call There has obviously been nothing remotely like that before.” Mr. Goldstein commented. Royal Caribbean has traditionally been an action-oriented cruise line. Indeed, Royal is known for its rock-climbing walls and its surfing simulators. Quantum will carry forward those features but will also have a new feature that will allow guests to experience sky-diving. Ripcord by iFly will be a skydiving simulator located near Quantum' stern. After a training session, guests wearing goggles, helmets and jump suits will enter a 23 foot tall glass chamber and be lofted by air currents for two one-minute flights. As with the surfing simulators on previous ships, there will also be a viewing stand for spectators. iFly operates a number of skydiving simulators on land but the one on Quantum will be the first one at sea. “I've tried it. It is a fun thing to do. It is challenging. It is not easy but if I can do it anyone can. As much as it is a fun thing to do, it is also a fun thing to watch other people make fools of themselves trying,” confessed Mr. Fain. As noted earlier, the traditional sports complex on Quantum will be indoors. However, RCI is doing more than putting a roof over the basketball court. Seaplex will include a regulation size basketball court that can also be used for soccer, volleyball and badminton. However, this area will also be used for circus training including trapeze lessons. On the mezzanine level, there will be activity rooms for table tennis, air hockey and similar games. Then towards evening, the court area will be given over to bumper cars and roller skating. Still later, the area becomes an entertainment venue with a DJ suspended over the dancers in a moving pod. “The Seaplex takes a lot of the activities that we are already known for with the sports decks that we have on most of our ships but now that is housed in an indoor area with all sorts of things going on in addition to those.” Mr. Goldstein said. Lower down in the ship on Decks 3 and 4 will be a two-deck high space called the Music Hall. During the day, this space will be used for activities such as dance lessons and improvisation classes. In the evening, it will be a performance venue with a center stage and an adjoining dance floor. The Music Hall will also have two bars and offer light fare. Another feature will be self-leveling billiard tables as on Royal's Radiance class ships. 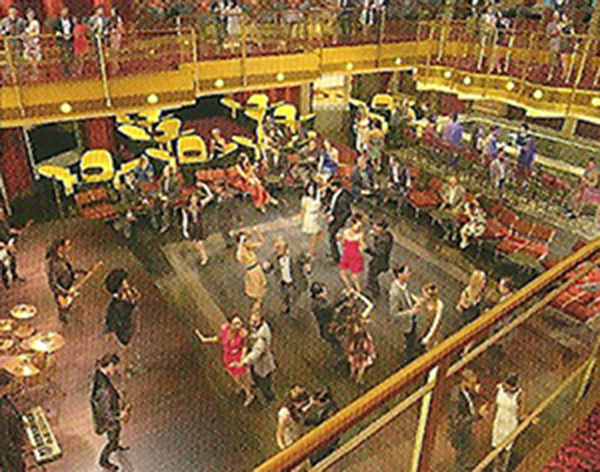 Located at the stern of the ship Two70 occupies the space often used for the main dining rooms on cruise ships. As on Celebrity's Millennium class ships or Norwegian's Jewel class ships, picture windows in such a location can produce unforgettable views. 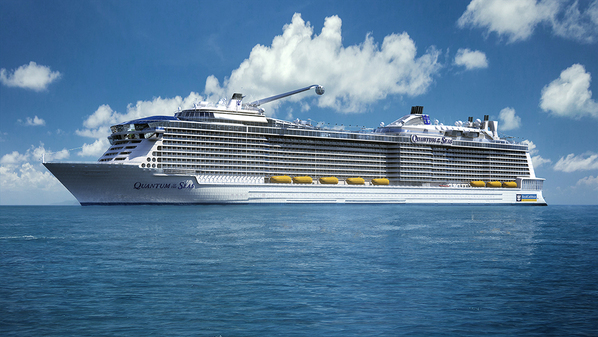 Quantum goes a step further with windows nearly three decks high that will offer 270 degree views. Furthermore, at night the windows will become projection panels aiding in the entertainment. The room itself is a multipurpose space. It will include a library and an activity workshop creating a space for guest lecturers, arts and crafts, and demonstrations. 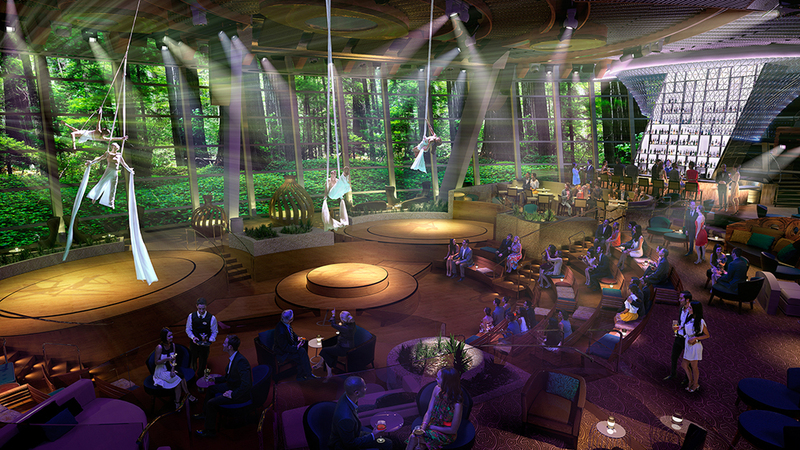 But it will also include a dining venue and a three-story curved bar complete with Royal's first ice bar. “You could say it is the living room or heart of the ship. During the day, it is a great place to hang out, read a book, or take it easy but then as day goes toward night, things begin to pick up and ultimately, you are looking at a stunning performance space. Indeed, the room will be terraced with varying levels of seating. Six robotic arms will be able to lower 100 inch LED screens into the room with images moving from one screen to another. Meanwhile, dancers and performers will be appearing not just on stage but in and around the audience. “We wanted entertainment of a massive scale but we [also] have the main theater - - the show theater, so this is a flexible space.” Mr. Fain elaborated. North Star will allow guests to view the ship, the ocean and the ports from a unique vantage point. (Images courtesy of Royal Caribbean). 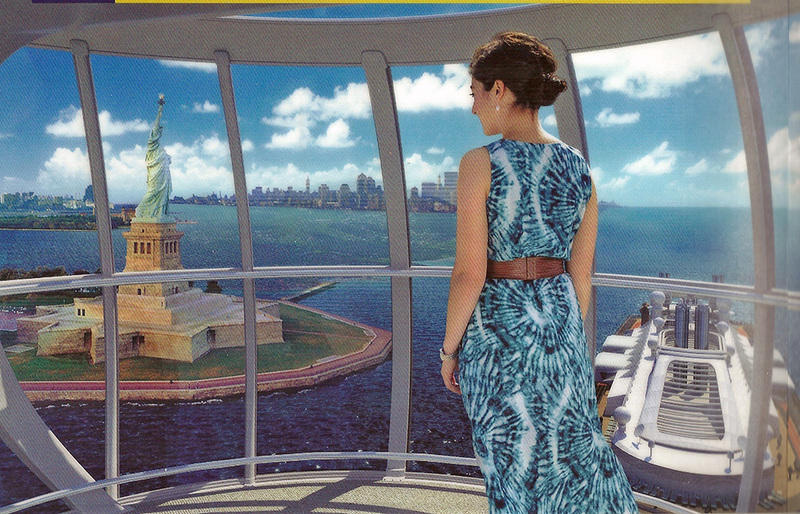 Guests will also be able to soar in the Ripcord by iFly skydiving simulator (above) (image courtesy of Royal Caribbean). Above: Royal Caribbean had a land-based version of the skydiving simulator at the Quantum of the Seas unveiling event. Below: Mr. Fain points the location of the skydiving simulator on Quantum of the Seas. The Sportsplex will have the ability to transform from an enclosed basketball court to a bumper car arena to a roller skating disco. (Images courtesy of Royal Caribbean). Two70 will also be multipurpose, transforming from a daytime activities center into a nighttime entertainment venue. (Images courtesy of Royal Caribbean). Above: Mr. Fain uses an iPad to lead the audience through on a tour of some of Two70's features. Right: The Music Hall. (Image courtesy of Royal Caribbean).